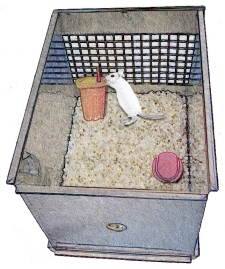 In the two-trial novel object recognition task, a rodent is placed in an enclosure and exposed for a set length of time to two identical objects that are located a specified distance from each other. The rodent is then removed from the environment and a predetermined amount of time is allowed to pass. The subject is then retested in the same environment except that one of the two previously used (familiar) objects is replaced with a novel object that differs from the familiar object in shape, texture and appearance (e.g., plastic block is replaced with a metal ball), and the rodent’s behavior is recorded. The recognition test is based on the natural tendency of rodents to investigate a novel object instead of a familiar one. The choice to explore the novel object reflects the use of learning and (recognition) memory processes.